The Polyvagal Theory is the product of decades of research by Stephen Porges. Through this lens we see the role of the autonomic nervous system as it shapes experiences of safety and affects our ability for connection. It provides a neurobiological framework for understanding the connection between the mind, body, and emotions. Polyvagal Theory provides a neurophysiological framework to consider the reasons why people act in the ways they do. S.H.A.R.E. 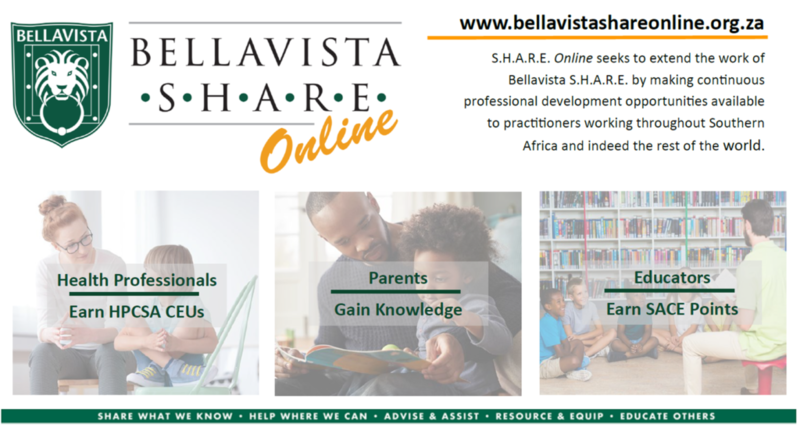 Online seeks to extend the work of Bellavista S.H.A.R.E. by making continuous professional development opportunities available to practitioners working throughout Southern Africa. With the launch of our online training website, we are delighted to bring our content directly to your staffroom, office or living room, without the loss of valuable teaching or therapy contact time. Expert mentors will guide and support your learning as you navigate our longer courses, while a quick quiz at the end of a short talk will check your understanding and enable you to earn HPCSA or SACE CPD points with ease. We look forward to welcoming you online soon!